Delayed past its original late 2017 timeframe, let alone the April and May estimates, NVIDIA’s G-Sync HDR technology finally arrived over the last couple months courtesy of Asus’ ROG Swift PG27UQ and Acer’s Predator X27. First shown at Computex 2017 as prototypes, the 27-inch displays bring what are arguably the most desired and visible aspects of modern gaming monitors: ultra high resolution (4K), high refresh rates (144Hz), and variable refresh rate technology (G-Sync), all in a reasonably-sized quality panel (27-inch IPS-type). In addition to that, of course, are the various HDR-related capabilities with brightness and color gamut. Individually, these features are just some of the many modern display technologies, but where resolution and refresh rate (and also input latency) are core to PC gaming, those elements typically work as tradeoffs, with 1440p/144Hz being a notable middle ground. 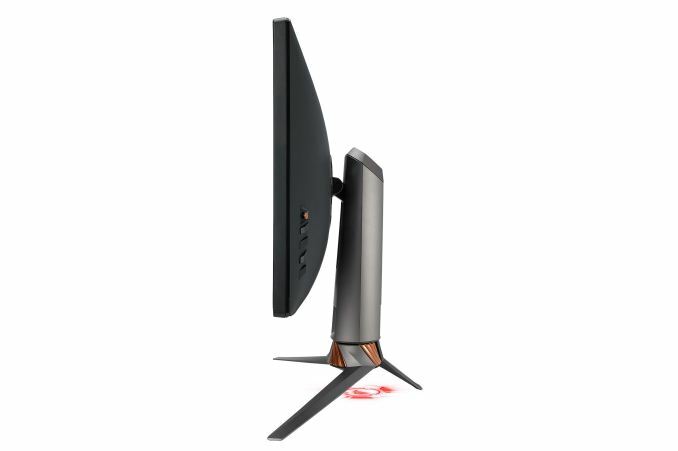 So by the basic 4K/144Hz standard, we have not yet had a true ultra-premium gaming monitor. 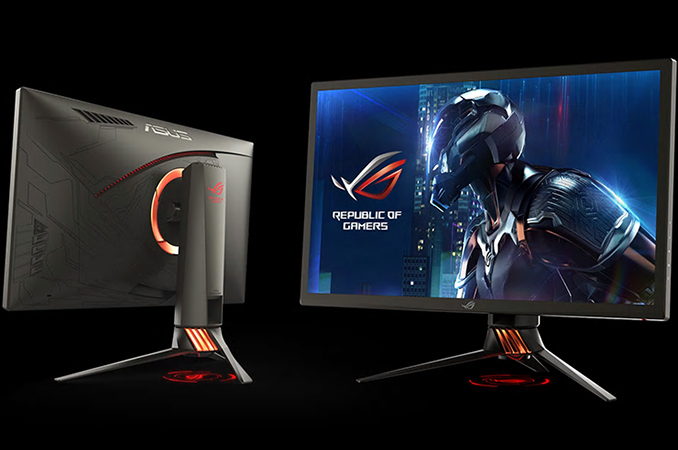 But today, we look at one such beast with the Asus ROG Swift PG27UQ. As an ultra-premium gaming monitor of that caliber, the PG27UQ also has an ultra-premium price of $1999. For reasons we’ll soon discuss, the pricing very much represents the panel’s HDR backlighting unit, quantum dot film, and G-Sync HDR module. The full-array local dimming (FALD) backlighting system delivers the brightness and contrast needed for HDR, while the quantum dot film enhances the representable colors to a wider gamut, another HDR element. The new generation G-Sync HDR module deals with the variable refresh implementation, but with HDR, high refresh rate, and high resolution combined, bandwidth constraints require chroma subsampling beyond 98Hz. In terms of base specifications, the PG27UQ is identical to Acer’s Predator X27 as it uses the same AU Optronics panel, and both monitors are essentially flagships for the G-Sync HDR platform, which includes the curved ultrawide 35-inch models and 4K 65-inch Big Format Gaming Displays (BFGD). Otherwise, there isn’t anything new here that we haven’t already known about in the long run-up. Furthermore, Asus’ ROG Swift PG27UQ also had a rather insightful channel for updates on their ROG forums, so there's some insight into the panel-related firmware troubles they've been having. One of the more interesting aspects about the PG27UQ is about its headlining features. The 3840 x 2160 ‘4K’ resolution and 144Hz refresh rate are very much in the mix, and so is the monitor being not just G-Sync but G-Sync HDR. Then there is the HDR aspect, with the IPS-type panel that has localized backlighting and a quantum dot film. G-Sync HDR means both a premium tier of HDR monitor, as well as the new generation of G-Sync that works with high dynamic range gaming. These features obviously overlap, and much of their recent developments are not so much ‘new’ as they are now ‘reasonably affordable’ to the broader public. For a professional class price, monitors for professional visualization have offered many of the same specifications. And most elements are ultimately limited by PC game support, even uncapped refresh rates and 4K+ resolutions. This is, of course, not including connection standards, design (i.e. bezels and thinness), or gaming monitor features (e.g. ULMB). All these bits, and more, are served up to consumers in a bevy of numbers and brands. Why does all of this matter? All of these points are points of discussion with the Asus ROG Swift PG27UQ, and especially to G-Sync HDR at the heart of this display. Gaming monitors are moving beyond resolution and refresh rate in their feature sets, especially as games start to support HDR technologies (i.e. HDR10, Dolby Vision, FreeSync 2 tone-mapping). To implement those overlapping features, much more has to do with the panel rather than the VRR hardware/specification, which has become the de facto identifier of a modern gaming monitor. The goal is no longer summarized by ‘faster frames filled with more pixels’ and becomes more difficult to communicate, let alone market, to consumers. And this has much to do with where G-Sync (and VRR) started and what it is now aspiring to be.